Ramón Delgado-Palacios: Waltz "La Dulzura de tu rostro"
Manuel Yánez: Waltz "Viajera del río"
Evencio Castellanos: Waltz "Mañanita caraqueña"
Juan Carlos Núñez: Waltz "Retrato de Ramón Delgado Palacios"
Luis Laguna: Waltz "Creo que te quiero"
Maria Luisa Escobar: Nocturne-Waltz "Noche de luna en Altamira"
Ricardo Teruel: Waltz "Destilado de vals"
After conductor Gustavo Dudamel, pianist Clara Rodriguez is perhaps the most important musical ambassador from Venezuela. Indeed, in her own words, the music of her country is extremely close to her heart, and her artistic objective is mainly that of putting Venezuelan musical culture on the international map. The 25 tracks chosen for this recording, Rodriguez's fifth in this series, all have an intimate connection between them simply for the fact that they are mostly pieces by living composers and arrangers, and have been handed down to Rodriguez by the creators themselves. 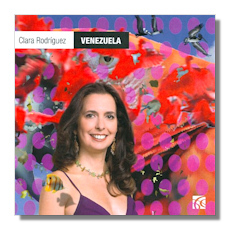 The crop of composers represented on this CD all command the respect and admiration of their fellow musicians, as through their ethics, humility and passionate work, they have succeeded in creating the Venezuelan musical idiom, an idiom built on the different genres such as the waltz, the joropo and the meringue. Undoubtedly, names such as Paesano (b.1946), Castellanos (1915-1984), Vollmer (1834-1901), Ruiz (b.1948), Escobar (1903-1985), Lauro (1917-1986), and Bor (1926-1988) among others all sound unfamiliar, especially to listeners in this part of the world, but these pieces are a joy to experience, and the beauty and colour of the Venezuelan landscape mingled with the buoyant nature of the people is consistently portrayed with superb craftsmanship. Rodriguez was born with this music in her soul, and her interpretations have that magical poetic eloquence and sparkling dynamism that only a genius can conjure up. Hi-tech sound and hugely informative annotations complete an issue overflowing with delightfully soothing sounds.